In January, my work at American Livestock Breeds Conservancy took me to California to lecture at the Ecofarm Conference in Monterey. As luck would have it, I had an extra day to take a side trip to visit the noted waterfowl producer, John Metzer, at his farm in Gonzales, not far from the conference site. Because ALBC continues to develop the production selection materials for these species, it was an opportunity not to be missed while in the area. John’s father had brought the hobby of waterfowl production to the Metzer family over 30 years ago. When John graduated from college, he thought he could turn his dad’s hobby into a full-time business which he began in 1972. 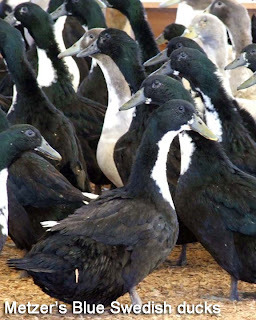 With much work, his endeavor has proven successful and the farm has become one of the largest hatcheries for waterfowl in the U.S. Currently Metzer Farms works with 17 breeds of ducks including a number of endangered breeds including Rouen, Khaki Campbell, Blue Swedish, Buff, Cayuga, Welsh Harlequin, White Runner, Black Runner, Blue Runner, and Chocolate Runner ducks. 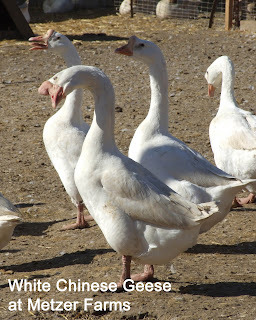 There are 12 breeds of geese managed on the farm including the endangered Toulouse, Chinese, Pilgrim, Buff, African, and Roman Tufted and Classic Roman geese. Egg production on the farm ranges from a winter time low of about 2,500 eggs per day to an impressive spring high of about 7,000 eggs per day. Upon arrival at the farm, I was greeted by John at his office and we immediately began a tour of the facility beginning with the incubation rooms. In 2008, new Jamesway incubators were installed in the facility replacing the old incubators, some of which were over 50 years old. The new incubators were a big step for the facility because each incubator can hold 35,000 eggs at a time! These incubators differed from the old ones in that they are used as “single stage” incubators. This means that all of the eggs in each are of the same age and are due to hatch together at the same time period. With this system it is easier to manage the changing needs of eggs as they mature without disrupting the needs of younger or older eggs that may be in the same incubator. John has been very pleased with the new incubators and has seen a 4-18+% increase in hatchability with the most dramatic improvement being found with the hatchability of the geese eggs. To learn more about single stage incubation results, read John’s article at http://www.metzerfarms.com/Articles/SingleStageIncubation.pdf . As we finished touring the incubation facility, we moved out into the farm and were greeted by hundreds of ducklings on pasture. The area was filled with Pekin ducklings whose bloodlines originated overseas in France. The Pekin is the breed most commonly used for meat in the U.S. and is one of Metzer’s biggest sellers. We moved from the Pekins to some of the areas that housed some of the rare breed ducks and we came upon the largest groups of Buff and Swedish ducks I’d ever seen. The Buff duck is an attractive, dual-purpose duck with the ability to lay up to 150-220 eggs per year. It grows quickly and can be ready for market within 8-10 weeks. Its light pin feathers do not show on the plucked carcass so this breed makes for an excellent table bird. Swedish ducks are medium-sized birds that weigh between 6 1/2 and 8 lbs. They provide well-flavored meat and up to 100-150 eggs per year. They are known to be a calm breed and are found in several colors including Blue, Black, and Splash. The multiple colors arise due to heterozygosity in their color gene. With this in mind, if a Blue Swedish duck and drake breed, the ducklings are typically 50% Blue, 25% Black, and 25% Splash. The American Poultry Association Standard of Perfection only allows for the Blue Swedish. The Buff duck is listed as “threatened” and the Swedish is listed in the “watch” category of ALBC’s Conservation Priority List. Beyond the duck enclosure, there were the pens that held an impressive collection of geese ranging from the small and delicate Chinese to the massive Dewlap Toulouse geese. 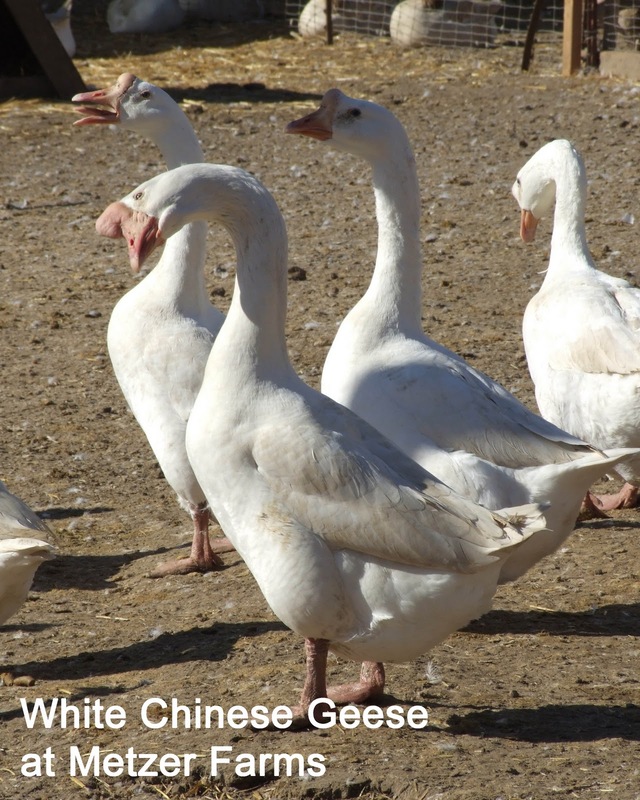 Chinese geese are among the best layers and are desirable as “watchdogs” that will be the first animals on the farm to alert farmers of intruders on the property. This breed is in the “watch” category of the CPL and is a popular choice for small farms. At Metzer farms, they can be found in the Brown and the White varieties. 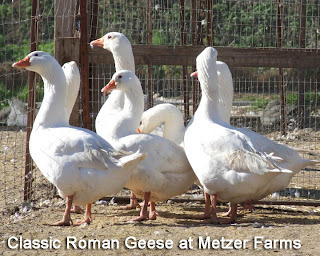 An interesting breed included in the Metzer collection was a flock of Classic Roman geese that came from the noted waterfowl breeder, Dave Holderread. Over the years, the Tufted Roman has become more popular in North America but it is the non-tufted, classic variety that is the original form of the breed. Few of this variety remain in the country and Metzer Farms is in the process of building numbers within their breeding flock before they will be able to offer goslings for sale. Roman geese are considered critically endangered. Other rare breed geese on the farm included the Pilgrim and the American Buff. Both of these breeds are American in origin and a great choice for backyard flocks. The Pilgrim goose is an auto-sexing breed meaning that males and females can be distinguished after hatching. Male goslings are silver-yellow with light-colored bills and females are olive-gray with darker bills. As adults the males are white and females are mostly brownish-gray with some white on their bodies and faces. American Buffs are known for their gentle disposition. Because of the light color of their pinfeathers, they dress out cleanly and make a great table bird for the holidays. Both breeds are considered critically endangered. Visiting with John was a rare opportunity to see such numbers of endangered waterfowl. As time grew short, the visit came to an end and I was on my way back to North Carolina, but not without some great images and useful food for thought on large scale incubation. To learn more about Metzer Farm visit http://www.metzerfarms.com/ and for more information on endangered waterfowl visit American Livestock Breeds Conservancy at http://www.albc-usa.org/.